Somersby decided to engage bloggers and vloggers to promote its brand with unique approach to cooperation with bloggers. The article was originally written by Jakub Prószyński. We are pleased to present you an excellent example of building relations with key individuals, who influence potential buyers. This case study concerns a recent marketing campaign related to a new product’s introduction – blackberry-flavored Somersby beer. All the activities were planned by the Carlsberg Group and conducted on the Internet and, more precisely, in the Polish blogosphere. beers. As of 2001, the Carlsberg Group is ranked as the fifth largest brewery group in the world. Carlsberg Group was introduced to the Polish market in March 2012. This case study examines a new product marketing campaign for the Somersby brand, which was launched into the Polish market in March 2014. 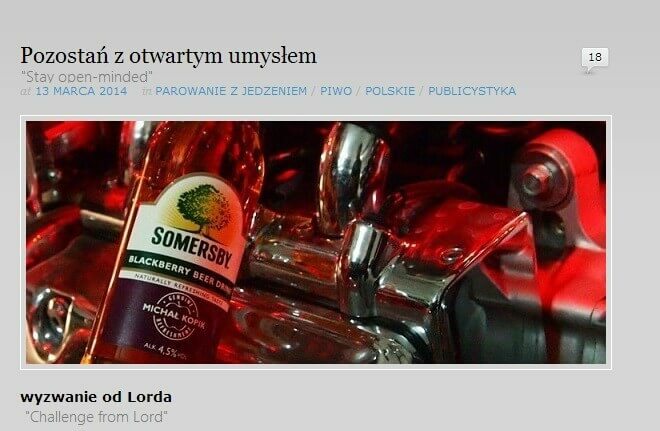 Before introducing their new Somersby Blackberry Beer to consumers, the Carlsberg Group requested the assistance of bloggers and vloggers within the Polish blogosphere to assist with the new product launch. This article presents the results of this unique cooperation. Who was Behind the Campaign? The Carlsberg crew included Maciek Pichlak, Joanna Dmochowska and Janek Rudziński. Product launch actions were supported by the popular Polish blogger – Kominek, Media agency PHD, Media Direction (Facebook and ads purchase), and the social media agency Fenomem (communication with other bloggers). Each of the participants received the same packages and rewards for their entries. We really admire Carlsberg’s approach of cooperating with bloggers equally. Authors of the blackberry beer campaign described their target group as consumers at the 18 to 35 of age, who shared similar lifestyle preferences. The target group’s characteristics included people who were open to new experiences, familiar with pop culture, and had somewhat of a sarcastic sense of humor (which would enables them to reading between the lines). More importantly, target group would be people who appreciated friendships, bonds with others, and who liked casual meetings over an alcoholic drink. Somersby is popularly believed to be the perfect beverage in such situations. In other words, the campaign was aimed at Millennials or, if you prefer, Generation Y. “New” product communications began around March 12, 2014. The participating bloggers and influencers were given personalized packages from Lord Somersby. As the first consumers they were able to taste the beer, which was due to be introduced into stores in the following days. The package contained a lanyard, personalized letter, six bottles of Somersby beer and some other gadgets. 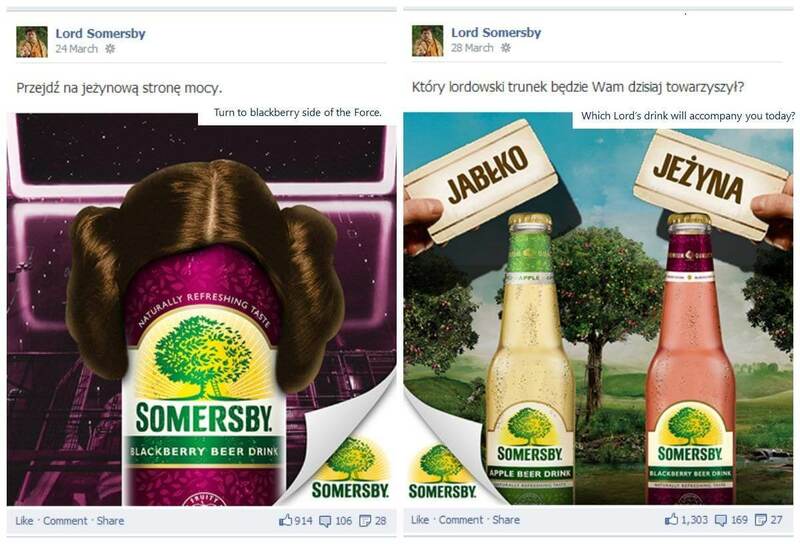 The campaign lasted until the end of March 2014 and, at this moment, communications related to Somersby’s blackberry beer flavor is a fixed element of social media for the brand. Data was provided by Brand24. Before we move on to examining the actions generated by the blogs, let’s first reviw Somersby’s fanpage. 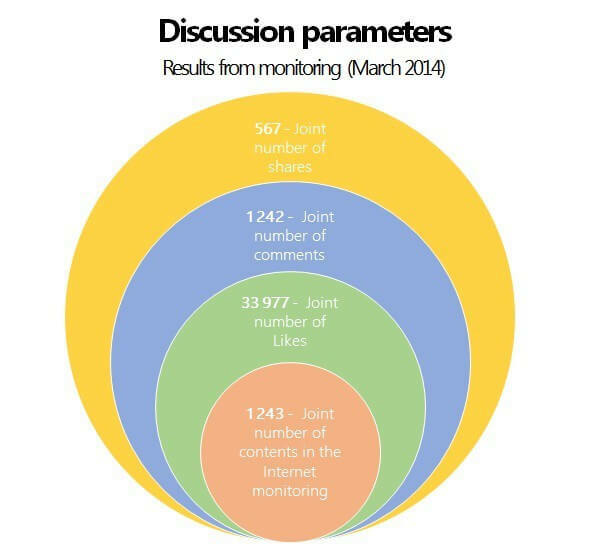 How were the activities in the blogosphere reflected on Facebook? Did they bring new fans? The results were positive and and certainly verifiable. Let’s look at a general summary of the Facebook activity. During the campaign, the number of fans doubled in number, the number of engaged users grew nearly four times, and the Interactivity Index increased almost four times. At first glance, we can assume that people were truly involved in the messages. The charts depicted below present engagement, interactions, and the increase in fans. All statistics indicate a noticeable growth from March 13, 2014 until the end of the month. Additionally, the statistics declined after the campaign, but remained at a higher level than before the campaign. This means that Somersby gained new active fans who wanted to interact with the brand and benefit from it. Shown on the first chart under the “newly engaged,” category is the number of fans who “liked” a page a previously and who have now taken some action (e.g. “liked” status), or are new fans who have “liked” the profile and also “liked” status or “commented” on it. This group totaled 3,707 people who were engaged during the campaign (All of the charts provide data from 1.01-31.05.2014.). After the first stage of the campaign (bloggers’ entries into social media), it was high time Somersby launched the blackberry beer to fixed communications. And again, it did it in its own style by appealing to pop culture, fun, and questioning users. The entry on the right side (below) might be called “Like Beggar”. Still, it is an excellent way to see if consumers accepted the product. Everything remained consistent with previous communications and the general style of Lord Somersby. Creative responses to all kinds of fans’ “pokes” further enhanced Somersby’s friendly image. Administrators of Facebook profile did the job perfectly. Did the new blackberry beer favor really appealed to users? On Iconosquare (previously Stati.gram), we found 115k photos from all over the world with hashtag #somersby. The pictures below present the first five results. All of them were taken by Polish users, and all focused on the new flavor. Some brands do not need to promote themselves – consumers can do that for them. One more interesting feature is the video below, which was created only for digital channels, and has now been viewed over 4 million times. This is a pretty good result in Polish media, and finally we have evidence of who invented social media. Somersby took a big risk by deciding to use only digital communication channels, but it turned out to be an effective solution. Using neither TV commercials nor billboard advertising, it succeeded in engaging users in interactions on Facebook. Naturally, bloggers influenced consumers’ behavior on the Internet as well. To sum it up, combined Facebook ads and the activities by bloggers bore fruit by enhancing the huge campaign’s reach and by eliciting positive responses. The first wave concerned “big” bloggers (jointly 13 blogs/vlogs): Eliza Wydrych (Fashionelka), Matylda Kozakiewicz (Segritta), Paweł Opydo (Zombie Samurai), Żorż Ponimirski (Street Food Polska), Paulina Jagodzińska (Beauty.Fashion.Shopping. ), Ewa Grzelakowska-Kostaglu (Red Lipstick Monster), Grzegorz Marczak (Antyweb), 5 Sposobów Na, Karolina Gliniecka (Charlize Mystery), Michał Kopik (Piwny Garaż), Dorota Kamińska and Łukasz Kielban (Czas Gentlemanów). Isn’t this impressive blogging and vlogging power? Statistics below concern only these 13 blogs and vlogs! These statistics include only interactions. The actual joint reach of all publications amounted to 961,602 unique users, who generated 1,205,940 hits. These numbers relate only to the 13 publications, and with a platform Blogostany.pl, another 70 people got engaged! Jointly, all blogs had 209k fans on Facebook, which equates to nearly 1.5 million unique visitors and over 4 million hits on Somersby’s profile! 1. 5 Sposobów Na… (Five ways for…) – Bloggers came up with five creative usages for the beer’s bottles. 2. 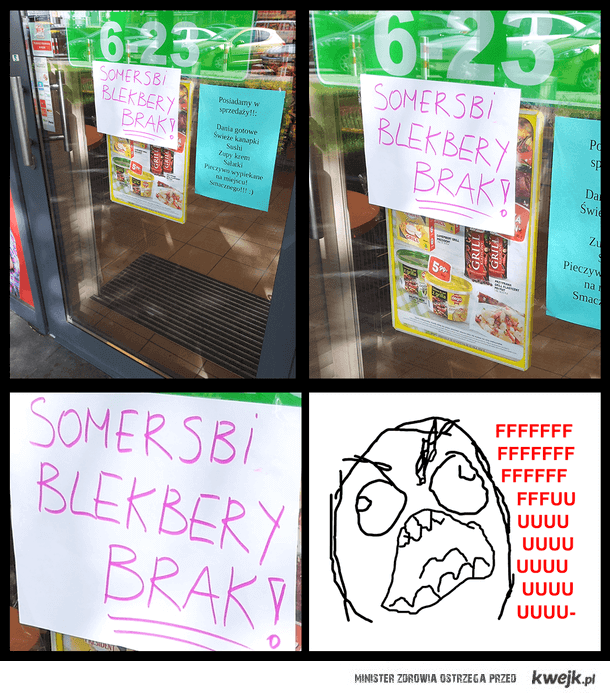 Antyweb – Blogger suggested a comparative “technological” test of two flavors of Somersby. A very good read. 3. Piwny Garaż (Beer Garage) – Blogger served some value added. We find some beer mixtures, and also recipes for courses that complement the beers perfectly. Contents generated in March, which related to Somersby, was estimated at nearly 5,000. Bloggers reached 1.62 million potential clients, (and, as the pictures from Instagram prove, not only potential, but also actual purchasers). All those consumers came across entries related to Somersby’s new flavor on an average of two times. It is not easy to define whether it is a lot, or rather a little, because the target group was susceptible to recommendations, especially from friends or other trusted sources. According to many studies, bloggers (who were the main driving force in the campaign) are perceived as trustworthy opinion leaders. At the end, we wanted to present an utterance by Tomek “Kominek” Tomczyk about the campaign. It turned out that he, as one of the strategists behind the campaign, enthusiastically and extensively talked about it. 1. What were the criteria for blogger selection? Did you focus only on their popularity and quality of contents, or also on the effects of previous Somersby’s campaigns? Tomek Tomczyk: Not only reach, but also a blogger’s experience and charisma count, when conducting such actions. We did not want bloggers that only presented themselves with a bottle of Somersby, but who would adjust the product to a blog’s profile. Karolina Gliniecka created an amazing stylization, Żorż Ponimirski invited readers for a banquet, Grzegorz Marczak conducted a “technological test,” and so on… A crucial factor in blogger selection was how a blogger cooperated with brands. I am not fond of people who do stuff routinely, fulfilling very precisely every point of an agreement, and who do not care about the success of a campaign. We selected bloggers who shared responsibility for the effects of cooperating with brands, and also those, who were creative. Many ideas were not mine, but included input from others such as Eliza Wydrych’s and Paweł Opydo’s. I spent many hours with them, discussing the campaign’s strategy. Another important element of recruitment was proper distribution of power. Except for several dozen less-known bloggers, we had some leading ones, who lifted the action up and later advised those inexperienced bloggers. When conducting a campaign with many bloggers, it is possible to save and draw in 40 average bloggers. And then, count for the result, because altogether they have a long reach. This mythical acts as a tunnel vision for marketers, because, at the time of social media, the highest reach is not generated by Kominek or some Prószyński on their blogs. It is generated by the Average Joe, who likes and shares the contents of other bloggers. If you don’t include famous people in your campaign, charismatic bloggers, or the experienced in this business, then forget about launching a successful campaign. Another thing is that the reach on fanpages is a whopper, because no agency asks a blogger for the actual reach of a single entry. And it is the same with monthly statistics on blog, which completely do not matter, such as sponsored entries, competitions, tests… Bloggers with 500 million unique users per month might as well generate only 2k hints. 2. How long did the preparations for this stage of the campaign last? How was the cooperation with agencies and the client? Tomek Tomczyk: Preparations lasted a few months, but we had to take into consideration the fact that they concerned not only the spring, but also the summer edition. It will be launched in a couple of weeks. Cooperation was just right. No misunderstandings, no disputes, huge amounts of rainbows and love. A friendly atmosphere arose from the trust I was given from Maciek Pichlak and Asia Dmochowska from the Carlsberg Group, and from the other agencies as well. Everyone had their own field of work and was responsible for that. 3. What do you consider to the best element of Somersby’s Blackberry launch? Tomek Tomczyk: We were afraid that we did not give bloggers enough freedom. There were no top-down orders about how often they had to write about the brand, how to depict it in photos, what to link to, or what to, in general, write about Somersby. Bloggers themselves had the final word in deciding what would be published on a blog. In addition, 100 bloggers participated in the campaign. It is a record in the history of the blogosphere. A lot of things could have gone wrong. However, we all agreed that if we wanted to do things well, the bloggers had to have carte blanche. Readers cannot have a feeling, that their favorite blogger is selling them some marketing babble written by any junior brand manager. Together with the author of the original case study, we agree that it was one of the best campaigns in the blogosphere. The main reason for this is the freedom given to bloggers. The brand trusted them and was not let down. Somersby has not said the last word yet. It aims at building solid relations with bloggers. So, we are eagerly looking forward to further campaigns, and once again a lot of credit for a job well done!